The bulls are trying to eke out some gains on Tuesday, but the indices aren’t moving much. That said, we are getting some big moves in individual names, so let’s take a look at our top stock trades for Wednesday. 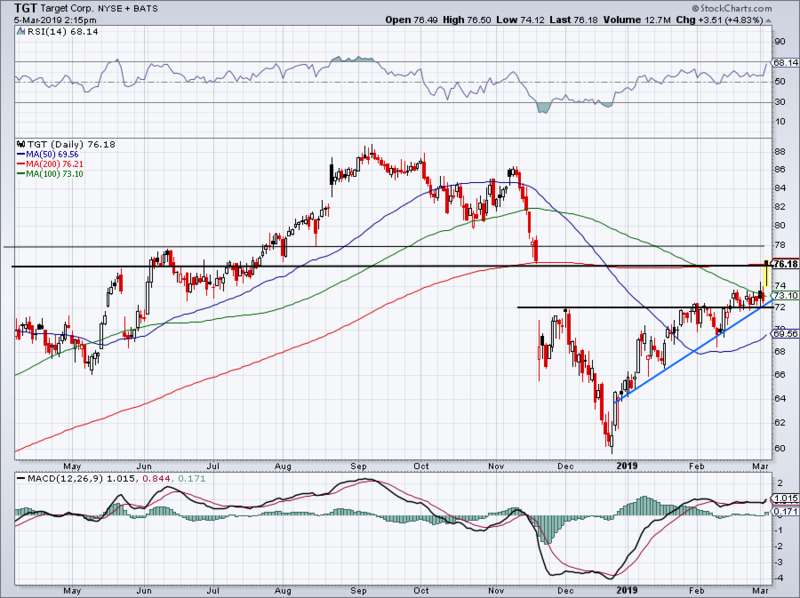 Seeing General Electric (NYSE:GE) break down from the $11-ish area is no surprise. The $10.75 level was critical support that gave way in the fourth quarter and it only makes sense — up almost 100% from the lows — that it’s resistance on the way up. With that said, the 200-day moving average is also near that mark and negative cash flow comments from its CEO aren’t help matters. The question now is, where does support come into play? Can the 21-day moving average prop up GE? It’s holding up now, but I wouldn’t bank on it sticking. Instead, I want to see $9.50 hold up. This was post-earnings support last month and I want to see this level “prove itself” as real support now in the face of negative news. Should it fail, see how the 50-day holds up. Over $10.75 and bulls may stomp on the accelerator. Named a top cannabis pick at Cowen has Aurora Cannabis (NYSE:ACB) up over 10% on Tuesday. The trend has been up so far this year and ACB is above all of its major moving averages. Clearly, bulls are in control. But bears have — more or less — dominated the $8 level. 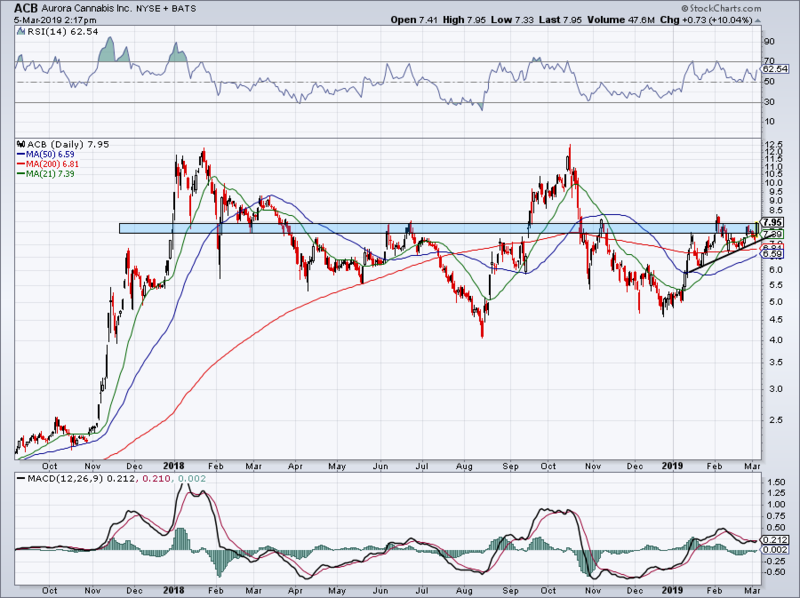 If ACB can breakout over that mark, it could spark a larger rally. Will it be enough to get back to $12? I don’t know, but it’s step one in doing so. See how ACB handles $8. 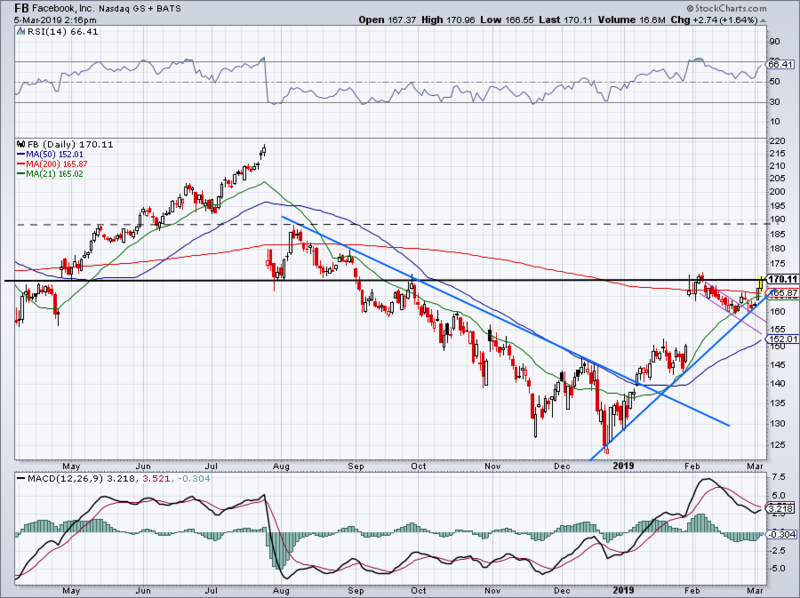 This FANG name keeps doing well, as Facebook (NASDAQ:FB) has been resilient lately. For those wondering why Salesforce (NYSE:CRM) isn’t on today’s list, see Monday’s pre-earnings scouting report. For Facebook, I want to see the stock get over $170, then hold that level as support. Shares have been trending higher since the December lows and this choppy market has required some patience. But if FB can hold up — and especially if it can get above and hold $170 — then $185 to $190 could be in the cards down the road. Shares of Target (NYSE:TGT) are jumping after the company’s better-than-expected earnings report. Up less than 5% though and bulls need to show some more conviction. I love that TGT was able to get above $72, a resistance level from December to early February, and then find that level as support. That’s exactly what we want to see in Facebook with $170, by the way. Tuesday’s pop propels TGT over the 100-day and 200-day moving averages. Now bulls need the move to stick. Preferably we’ll get some chop between $76 and $78, with $76 and the 200-day acting as support. An eventual move over $78 is the goal though, whether that happens quickly or slowly doesn’t matter. Chinese stocks are flying, with names like iQiyi (NASDAQ:IQ), Sogou (NYSE:SOGO) Nio (NASDAQ:NIO) and others ripping. They’re all being led higher by Huya (NYSE:HUYA), which is up 22% in the session. 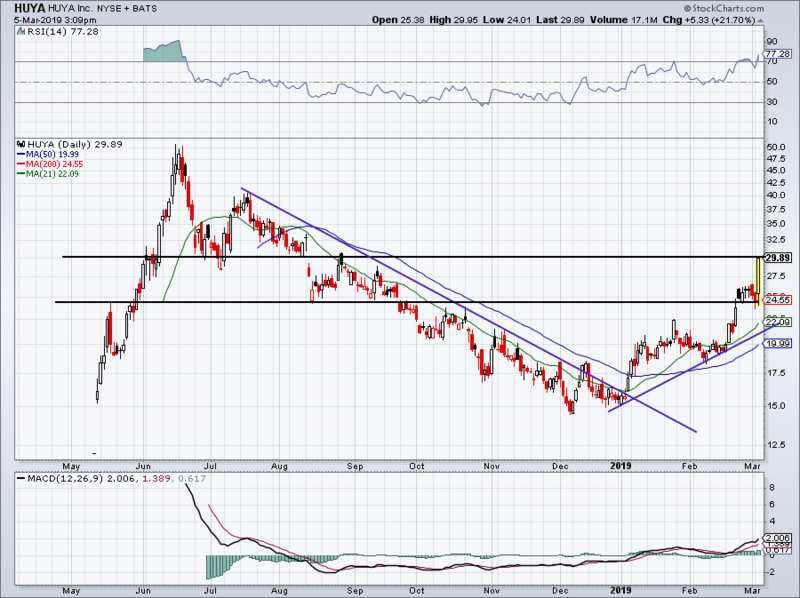 The move off $24 was critical, seeing as that it played a pivotal role in the stock’s short trading history. It’s also near the newly-established 200-day moving average. I’m a bit leery on Huya surging into the $30 mark, given that this level was also significant in the first few months of its public life. But if Huya can push through this level, then bulls have a solid risk/reward level to play against. 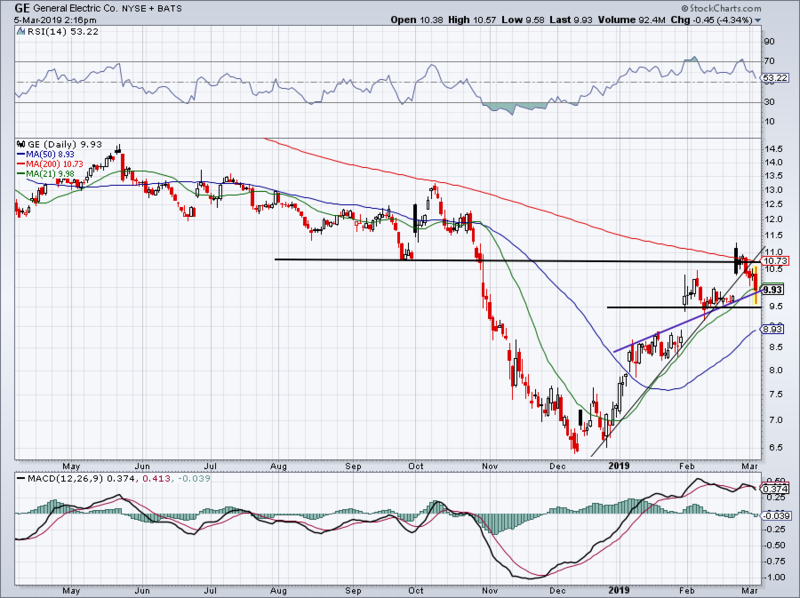 Since breaking out of downtrend resistance in January, this name and many others like it have been on fire. Keep in mind though, how far away the 21-day moving average is from current prices. If you’ve been long this name since our earlier breakout call in January, I would consider using Tuesday’s monster rally as an opportunity lock in some gains. Bret Kenwell is the manager and author of Future Blue Chips and is on Twitter @BretKenwell. As of this writing, Bret Kenwell is long IQ. 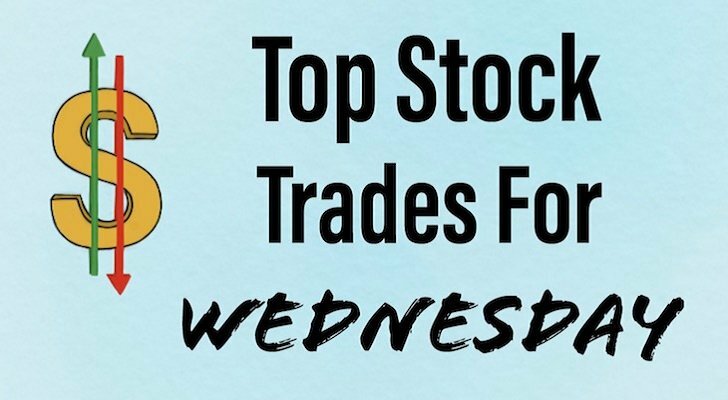 Article printed from InvestorPlace Media, https://investorplace.com/2019/03/5-top-stock-trades-for-wednesday-ge-aurora-cannabis-target-earnings/.